Log onto the Internet with your computer, and you can find almost anything. As we have come to realize, “anything” now includes streaming videos. While the Internet can be the conduit for paid streaming services like Netflix and Hulu Plus, you can also access a tremendous amount of programming on your computer, totally free of charge. We’re all aware of YouTube, where anybody can upload videos for the whole world to see. On occasion, I’ve spent a whole evening just surfing YouTube. (Okay, I was kind of hard up for something to do). But there’s a lot more than YouTube out there, if you’re willing to do a little digging around. Probably the richest source of free Internet TV is on hulu.com. I’m not talking about Hulu Plus, the paid subscription service that I reviewed back in February. I’m now just referring to the garden variety Hulu, where you can watch all kinds of TV on your computer, and not pay a dime. The free Hulu.com gives you access to some current TV programming, delayed approximately a week from the original air date. You can also watch hundreds of old classic TV shows, plus thousands of movies and documentaries. And it’s all free. The downside is that the video quality is not real good (in contrast to Hulu Plus, where you can stream HD quality). The other downside is that you can only watch on a computer. “But wait!” as they say on the late night infomercials. “There’s more.” Keep reading, and I’ll show you how to get those computer-only videos displayed on your TV. This is just a smattering of the hundreds of shows that you will find on Hulu.com. Major networks also provide you with some online shows and videos. ABC, CBS, NBC, Discovery Channel, History Channel, and TV Land all have streaming available for a selection of programming. In these cases you may have to do a little searching and browsing to come up with things that you would enjoy. That brings me to a project I have been working on for some time. This started out as just a way for me to keep track of my own favorite links to online TV. But, as a matter of full disclosure, it’s turned into a business. Inasmuch as it’s totally relevant to the current discussion, I’ll tell you about it. The only difficult thing about free online TV can be finding it. It’s scattered all over, and when you do arrive at a Website that contains anything you would actually want to watch, you may have to surf around on the site for awhile to find the link to the videos. FreeTVconnection.com is the missing “link” (no pun intended) that makes it easy to locate and play online TV shows from all different genres. Rather than taking up a lot of space to describe it here, I’ll let you check it out yourself. While it is a paid membership site, there is a free trial option that I would encourage everyone to take advantage of. That will not only give you full access to the site, but will let you do a lot of exploring of the kinds of free TV you can access on the Internet. So we’ve talked about a lot of things in the last four months worth of articles. Now, just how do you go about hooking everything up to take advantage of all the Internet TV options? If you break all our discussions down into small bits, it really turns out to be quite easy. GET INTERNET ACCESS TO YOUR TV – I’m assuming your Internet service comes into an office area, where you have your modem and router. How do you get your Internet service into your living room or TV area? 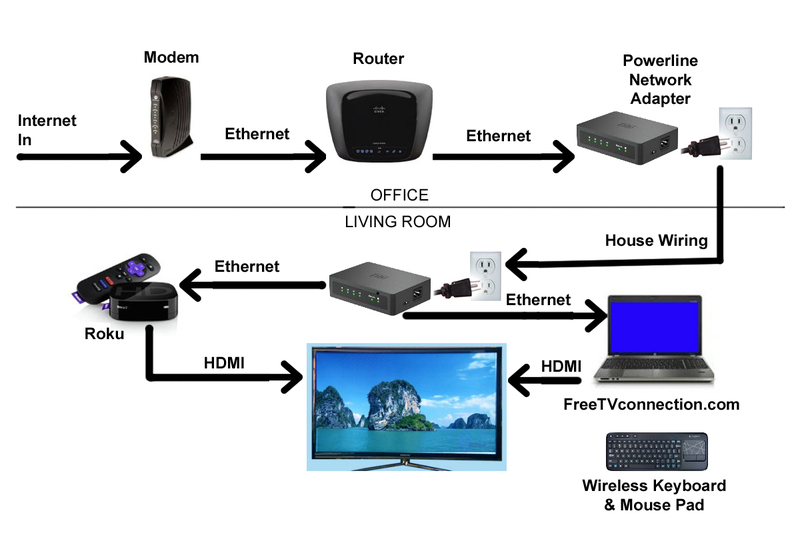 This diagram illustrates using the Powerline Network Adapter (discussed in my January article), that essentially wires your entire house for Internet by sending the signal over your household wiring. This is usually more reliable than Wi-Fi for the demands of streaming TV. But you can use Wi-Fi if it works for you. FOR SUBSCRIPTION SERVICES LIKE NETFLIX, HULU PLUS, ETC – Using an Ethernet cable, connect the living room end of a pair of powerline network adapters to your set-top box (Roku or other), a game console or Blu-ray player that supports Internet TV, or directly to your Internet-ready “smart” TV. Then connect the Roku or other Internet TV device to your TV with an HDMI cable. FOR FREE INTERNET TV SOURCES LIKE HULU.COM OR FREETVCONNECTION.COM – Connect the living room end of a pair of powerline network adapters to your laptop computer with an Ethernet cable. Then connect the computer to your TV with an HDMI cable. You will find sources of the hardware in this diagram under the “Toys” tab on this Website. Yes, even though I’m wrapping up the Internet TV discussion, there will be a next time. There is so much going on in consumer technology right now, I’ll have a hard time choosing what to write about. Whatever it is, I hope you’ll find it interesting.